During any period in which we stay in a property, collecting piles of items we don’t need is inevitable. Whether it’s a room full of children’s toys left untouched for years, or old furniture disposal – we’ll take care of your Acton rubbish removal for you. 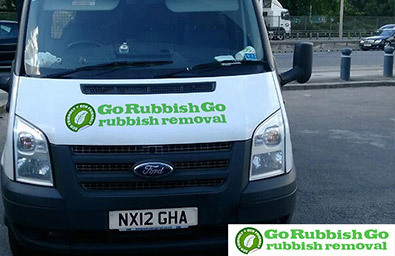 Go Rubbish Go’s services available in the W3 and W12 areas enable you to benefit from affordable waste removal W3, without the hindrance of needing a skip permit. Our rubbish clearance Acton, W3 ensure that whether you’re in need of garden waste clearance or any other kind of waste disposal, you are left with a clear, empty space. We understand that moving heavy furniture, or clearing out old electrical items is hard work, thus we train our professional staff to the highest standard, so that they can do it for you. So whether you’re looking for Acton waste disposal W3 or simply need help getting rid of old junk from your home, call 020 8610 9182 today for a free quote or to book our services! Is your attic full of junk that you no longer need? Do you need to clear your entire home or just a part of it of waste and old furniture? Is your garden in urgent need of a thorough clearance? If you answered any of these questions with a “yes”, then you’ve come to the right place. 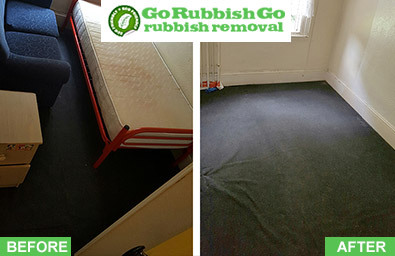 Go Rubbish Go offers an extensive selection of Acton rubbish removal services that have been developed with the customer in mind and aim to meet your every need related to household or commercial waste. Book an appointment with our experienced team of waste collectors today and say goodbye to that pesky rubbish for good! These guys helped me deal with the enormous amount of waste cluttering up my garage in Acton, W3. 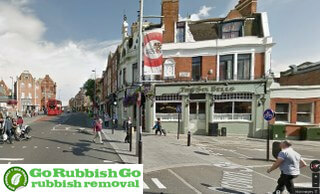 Their rubbish removal service is not only fast and efficient, but also very competitively priced. Would hire again! Our Acton Waste Collection professionals are trained to dispose of your junk items in the best way possible – let us help you out! Our Acton W3 rubbish disposal professionals work exceptionally hard to provide you with a waste removal service that cannot be beaten in the entire Acton area. For a very low price, we work with you to ensure that your needs are met entirely. Our professionals work as a team to provide every possible aspect of a W3 waste clearance service you could need – including transport to carry your junk items. We dispose of your waste in an environmentally friendly manner, keeping in mind all rubbish disposal regulations and aiming for the re-use of your cleared items wherever possible. Get Your Property Cleared With Our Acton, W3 Waste Removal Service! By hiring Go Rubbish Go. to clear your property in the W12 area for you, you will save yourself a considerable amount of time and effort. We work on a tight schedule, meaning that you won’t be waiting around for us to arrive or to get the job done – we work as quickly and efficiently as possible. Not only will you save yourself time by hiring us, but money too! Our prices are incredibly competitive and by hiring us, you’ll save yourself a lot of money that may otherwise be wasted on a skip and acquiring a permit for it. Whether you need help with a loft clearance, or maybe you’ve had some work done and need builders waste clearance – give us a call today on 020 8610 9182 for more information or for a free quote on our expert W3 waste collection Acton services! Acton was originally a small village, and its name means ‘oak trees’. However, with the expansion of London, it now finds itself heavily urbanised in West London, in the borough of Ealing. It boasts many attractions, including The London Motorcycle Museum and The Musical Museum. The two main postcodes within the district are W3 and W12, both of which mainly consist of residential areas. With a population of over 62,000 people, Acton is a very desirable place to live. It has a lovely shopping high street and is within easy access of Central London via the Piccadilly line and the District line. Acton High Street holds many bars and restaurants, ranging in a variety of cuisines and attracting a variety of people. The area also boasts other leisure facilities such as a public library, a children’s play park and a bowls green with its very own café for the locals to enjoy and socialise within.